The overthrow of Czarist rule in February and the winning of some important democratic rights did not mean the end of the revolution. Rather it was the beginning of the struggle to determine what would be the shape of the new Russia that the vast majority of the population wished for. Immediate issues were posed and the working class and peasantry were determined to use their new won freedoms to win their demands. Key was whether Russia would continue to participate in the First World War. At the same time, there were the social questions concerning the conditions of the working class, the demands of the peasantry for control of the land they worked and the guaranteeing of democratic rights and freedom from persecution. In addition the nationalities suppressed within the Russian Empire had their own demands for an end to oppression and the right to decide their own future. The first “solutions” of the provisional government to these demands and pressing problems tried to sidestep these key issues. This was hardly a surprise. Created five days after the revolution began, by most of the parties allowed in the only partially democratic Duma (parliament), the first provisional government was almost entirely bourgeois in composition and wanted as little change as possible. Initially the Duma parties had formed a provisional committee on February 27 (March 12 in the old Julian calendar used in Czarist Russia, March 12 in the present day calendar) that sought to get approval from the Czar for changes but he refused. But, faced with the revolution’s rapid development, including more and more military units joining the uprising, the Czar abdicated while the Duma’s committee dropped three of its right wing members and created a ‘Provisional Government’ on March 2. “3. In all their political actions, units are subordinated to the Soviet of Workers’ and Soldiers’ Deputies and their own committees. “4. All orders issued by the Military Commission of the State Duma shall be carried out, except those which run counter to the orders and decrees issued by the Soviet of Workers’ and Soldiers’ Deputies. This potential challenge to the ruling class’s authority was a factor in the next day’s decision by the Duma’s provisional committee to give way to a “Provisional Government,” headed by a prince and almost completely made up of capitalist politicians. From the outset both these “provisional” bodies sought to get an agreement with the leaders of the newly formed Petrograd Soviet. Lacking mass popular support, the Duma parties wanted to use the Soviet leaders as a brake on the revolution. The initial Petrograd Soviet “executive committee” created on February 27 was self-appointed by reformist leaders, using the famous name from the 1905 revolution, before the Soviet itself was constituted. Politically these first Soviet leaders, overwhelmingly Mensheviks and Social Revolutionaries, wanted to reach a deal with the Duma politicians and had no intention of seeking to overthrow capitalism. Thus the Soviet’s new daily newspaper, Izvestia, sympathetically reported the government’s formation as follows: “The Temporary Committee of the members of the State Duma, with the help and the support of the army and the inhabitants of the capital, has now attained such a large measure of success over the dark forces of the old regime that it is possible for the Committee to undertake the organisation of a more stable executive power” (March 3 (March 16 in the old Julian calendar)). This position was not unexpected as it flowed from the policies of the Menshevik and Social Revolutionaries’ leaderships. After the revolution, in mid-1918, Maxim Litvinov, the first representative of the Bolshevik led post-October government in Britain, described to British activists the political tendencies in the Russian workers’ movement. He explained that the Mensheviks “were now arguing that the revolution must be regarded as one similar to those which preceded it in Europe, that is, as a bourgeois revolution destined to bring the capitalist class to power and establish a bourgeois state. The [Bolsheviks], on the contrary, were of the opinion that inasmuch as the hegemony in the revolution clearly belonged to the working class, which with the landless peasantry was in alliance, it must and should lead to the establishment of the proletarian rule, and, at least, to a considerable modification of the bourgeois’ state in a socialist direction. Trotsky went so far as to assert that the state could be directly established on socialist lines. Accordingly, the Mensheviks were throughout in favor of a political alliance with the bourgeoisie, especially the so-called Constitutionals Democrats [‘Cadets’ for short], and were opposed to the continuance of the struggle beyond the point accepted by them as, provisionally or permanently, as final. On the other hand, the Bolsheviks demanded that the proletariat should go on with the revolutionary fight, even against the will of the bourgeoisie, so long as it enjoyed the support of the landless peasantry,” (“The Bolshevik Revolution: Its Rise and Meaning”, first edition, London, 1918). But the Mensheviks and Social Revolutionaries were themselves under pressure from the revolutionary ferment. All the time they tried to combine concessions, largely verbal, to the revolutionary mood, with working alongside the provisional government. But this was far from easy, as the revolution and the provisional government represented two hostile, conflicting forces. This clash was, for example, reflected in point 4 of Order No.1, where the reformist Soviet leaders tried to blend together the conflicting forces of the Duma parties and the Soviets. “Long live the international solidarity of the proletariat and its struggle for final victory…the time has come to start a decisive struggle against the grasping ambitions of the governments of all countries; the time has come for the people to take into their own hands the decision of the question of war and peace. March saw other attempts by the provisional government to block fundamental change and preserve the essence of the old Russian state, with the rejection of calls for land reform and action on the desperate food crisis. Instead it condemned looting and land seizures, while also rejecting calls for self-determination by Finland and the Russian-ruled parts of Poland. The kind of situation unfolding in Russia – with the capitalists attempting to hold onto power while the working class and poor sought to use their new found strength to make fundamental changes – has been seen in the early periods of nearly all revolutions in capitalist countries. However this situation of “dual power,” of classes competing for power, would not last indefinitely. The history of all prior (and subsequent) revolutions showed sooner or later one of the competing classes would emerge victorious. Lenin, then living in exile in neutral Switzerland, immediately sought to outline the program and strategy which the Bolsheviks needed in order to be able to build a movement that could bring victory to the Russian workers and peasants. Despite having only limited information in that pre-radio, TV, cell phone and internet age, Lenin was able, on the basis of the past experience of the Russian and international workers’ movement, to outline in his first “Letter from Afar” the essentials of the situation: “The Octobrist-Kadet bourgeois government, which wants to fight the imperialist war ‘to a finish’, and which in reality is the agent of the financial firm “England and France,” is obliged to promise the people the maximum of liberties and sops compatible with the maintenance of its power over the people and the possibility of continuing the imperialist slaughter. “The Soviet of Workers’ Deputies is an organisation of the workers, the embryo of a workers’ government, the representative of the interests of the entire mass of the poor section of the population, i.e., of nine-tenths of the population, which is striving for peace, bread and freedom. The Russian workers’ second ally “is the proletariat of all the belligerent countries and of all countries in general … With these two allies, the proletariat, utilizing the peculiarities of the present transition situation, can and will proceed, first, to the achievement of a democratic republic and complete victory of the peasantry over the landlords, instead of the Guchkov-Milyukov semi-monarchy, and then to socialism, which alone can give the war-weary people peace, bread and freedom” (Lenin’s first “Letter from Afar”, March 7 (March 20 in the new calendar), Collected Works, Volume 23). 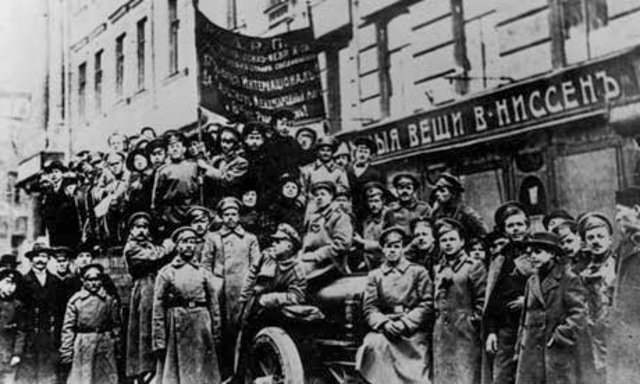 By March 8, the first demands were being made in Petrograd for the five day old provisional government to be dissolved and replaced by the Soviet. However among many of the local Bolshevik leadership there was a mixture of confusion and lack of clarity. While Lenin’s first ‘Letter from Afar’ spoke of the Soviet being “the embryo of a workers’ government” the Bolsheviks’ previous, more general formula, as Litvinov honestly described in his 1918 pamphlet, was less clear. The Bolsheviks’ previous general slogan of a ‘democratic dictatorship of the proletariat and peasantry’ did not precisely answer what program should be proposed. Among many Bolshevik leaders there was confusion as to what exactly should be their position towards the Provisional Government. At that time there really were two trends within the Bolsheviks. One believed that the Provisional Government should be supported when it did something positive. The other arguing that the Bolsheviks should be campaigning for, as Lenin put it, a “workers’ government,” a demand which was concretized as “All Power to the Soviets”. This debate would be generally resolved at the party’s April conference. From the beginning of the revolution significant sections of the Bolsheviks, for example those in the Vyborg industrial district in Petrograd opposed the Provisional Government. During the February revolution itself, the Vyborg Bolsheviks produced a leaflet calling for the election of a Soviet, the ousting of the autocracy and transfer of power to the Soviet. The February revolution’s success, the overthrow of a centuries’ old autocracy and the winning of democratic freedoms, naturally produced an atmosphere of joy and liberation. For many, particularly the large numbers who were only now beginning to become involved in struggle, it could appear that the main battle was over. However this was not at all the case. The old ruling class still held power and was determined to bring the revolution to an end. The challenge facing the Bolsheviks was to win majority support for the second, socialist, revolution that was necessary to achieve the aims and ambitions of working people. Politically this had to be based upon, in the words of a telegram Lenin sent on March 6 (March 19), “absolute lack of confidence; no support to the new government”. Of course, there was the serious issue of the defense of the revolution, but among some Bolshevik leaders this was viewed as supporting the capitalist Provisional Government “insofar as it struggles against reaction or counter-revolution”. However this ignored the fact that the government based itself on continuing capitalism. As the Bolsheviks later showed in August, when striving to defeat the counter-revolutionary Kornilov rebellion, there is a fundamental difference between fighting reaction and giving political support to a pro-capitalist government. Trotsky, in his History of the Russian Revolution, described the confused, initial position of the Bolsheviks in Russia to the questions being posed by the revolution: “For Bolshevism the first months of the revolution had been a period of bewilderment and vacillation. In the ‘manifesto’ of the Bolshevik Central Committee, drawn up just after the victory of the insurrection, we read that ‘the workers of the shops and factories, and likewise the mutinied troops, must immediately elect their representatives to the Provisional Revolutionary Government.’ The manifesto was printed in the official organ of the Soviet without comment or objection, as though the question were a purely academic one. But the leading Bolsheviks themselves also regarded their slogans as purely demonstrative. They behaved not like representatives of a proletarian party preparing an independent struggle for power, but like the left wing of a democracy, which, having announced its principles, intended for an indefinite time to play the part of loyal opposition. “Sukhanov asserts that at the sitting of the Executive Committee on March 1 the central question at issue was merely as to the conditions of the handing over of power. Against the thing itself – the formation of a bourgeois government – not one voice was raised, notwithstanding that out of 39 members of the Executive Committee, 11 were Bolsheviks or their adherents, and moreover three members of the Bolshevik centre (leadership), Zalutsky, Shliapnikov and Molotov, were present at the sitting. “In the Soviet on the next day, according to the report of Shliapnikov himself, out of 400 deputies present, only 19 voted against the transfer of power to the bourgeoisie – and this although there were already 40 in the Bolshevik faction. The voting itself passed off in a purely formal parliamentary manner, without any clear counter-proposition from the Bolsheviks, without conflict, and without any agitation whatever in the Bolshevik press. “On the 4th of March the Bureau of the Bolshevik Central Committee adopted a resolution on the counter-revolutionary character of the Provisional Government, and the necessity of steering a course towards the democratic dictatorship of the proletariat and the peasantry. The Petrograd committee, rightly regarding this resolution as academic – since it gave no directives for today’s action – approached the problem from the opposite angle. ‘Taking cognisance of the resolution on the Provisional Government adopted by the Soviet,’ it announces that ‘it will not oppose the power of the Provisional Government in so far as,’ etc. … In essence this was the position of the Mensheviks and Social Revolutionaries – only moved back to the second line trenches. This openly opportunist resolution of the Petrograd Committee contradicted only in a formal way the resolution of the Central Committee, whose academic character had meant nothing politically but putting up with an accomplished fact” (Trotsky, ‘History of the Russian Revolution’, Chapter 15). “Trotsky went on to describe how some Bolshevik leaders returning to Petrograd from their state-imposed exile further pushed the party towards what was, in essentials, a Menshevik position of accepting the provisional government and not arguing that the Soviets should take power into their hands. “Kamenev, a member of the emigrant editorial staff of the central organ, Stalin, a member of the Central Committee, and Muranov, a deputy in the Duma who had also returned from Siberia, removed the old editors of Pravda [the Bolsheviks’ daily newspaper], who had occupied a too ‘left’ position, and on the 15th of March, relying on their somewhat problematical rights, took the paper into their own hands. In the programme announcement of the new editorship, it was declared that the Bolsheviks would decisively support the Provisional Government ‘in so far as it struggles against reaction or counter-revolution.’ The new editors expressed themselves no less categorically upon the question of war: ‘While the German army obeys its emperor, the Russian soldier must stand firmly at his post answering bullet with bullet and shell with shell.’ ‘Our slogan is not the meaningless ‘down with war.’ Our slogan is pressure upon the Provisional Government with the aim of compelling it … to make an attempt to induce all the warring countries to open immediate negotiations … and until then every man remains at his fighting post!’ Both the idea and its formulation are those of the defensists. This programme of pressure upon an imperialist government with the aim of ‘inducing’ it to adopt a peace-loving form of activity, was the programme of Kautsky in Germany, Jean Longuet in France, MacDonald in England. It was anything but the program of Lenin, who was calling for the overthrow of imperialist rule. Defending itself against the patriotic press, Pravda went even farther ‘All ‘defeatism,’’ it said, ‘or rather what an undiscriminating press protected by the czar’s, censorship has branded with that name, died at the moment when the first revolutionary regiment appeared on the streets of Petrograd.’ (Trotsky ibid). In other words Kamenev and Stalin were mixing up defending the revolution with defending the capitalist Provisional Government which, at that time, was overwhelmingly made up of capitalist politicians. Would the ruling class be able to defeat the revolutionary wave or would the Russian working class be able to seize the opportunity to end the war and lead a revolutionary overthrow of capitalism? These would be the key issues in the coming months. Next articleAre there Leninists in the White House?